I have been getting a lot of emails and questions on the internet, concerning backcountry camping trip planning in Olympic National Park. These various hikers are heading out into wilderness and running into deep spring snow at lower elevations than what they anticipated. "...but it was melted out in the pictures I saw online from last year?" Let's go over some important points on what causes this recent trend in misinformation. The internet is a very powerful tool. A person can be whisked around the world, with just one tap of the finger. Hikers have evolved with the technology, using the resource for trip planning. Millennials now use social media (Facebook and Instagram) to get a new type of trip report and learn about new places to explore. The problem is that photography is timeless. It freezes that moment in time, but since there is no reference and all years are not the same. Conditions will not be the same, even if the date is. Over the years websites have been put on the internet, with the purpose of collecting trail conditions from hikers, that have recently been on that specific trail. With a simple search, a person can research an upcoming trip. However, this will bring us to the same place of having nothing to reference, when analyzing conditions and snowpack. These things can change so dramatically year to year. These websites should be more responsible or provide a disclaimer. Case in point is the snowpack in Olympic National Park for 2017. It strongly resembles the same snowpack as almost a decade ago. This means that the most trip reports and all the photos on the internet are worthless, when comparing snow depths and places melted out for the season. What is the solution? Ask a ranger or wait until new trip reports come in for the summer. Don't get stuck in a hard place. Always plan for the worse conditions and hope for the best! Planning your trip? 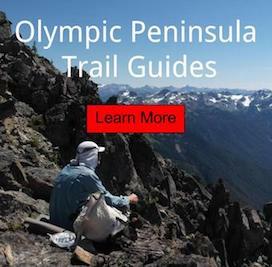 Check out the top trail guides for the Olympic Peninsula!